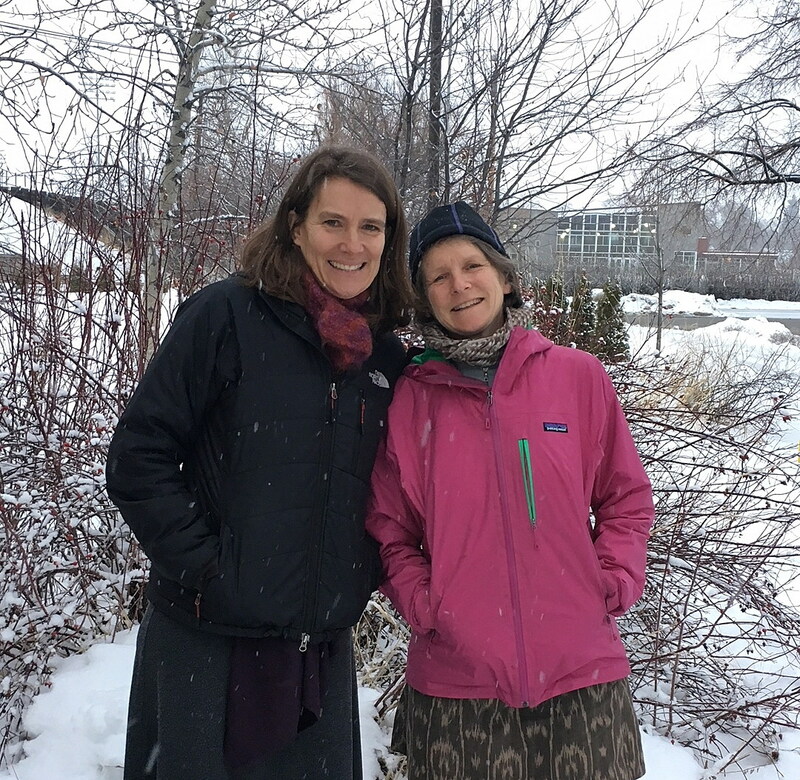 Katie Deuel, left, is the executive director of Home ReSource and Amy Cilimburg, right, is the executive director of Climate Smart Missoula. The start of a new year always has civic-minded folks like us simultaneously looking forward and back. What did we accomplish? What can we bring forward that activates and serves our community? What, truly, is sustainability? Overplayed in speech and title, sustainability is often under-resourced in action and seldom fully defined. We like this definition: Sustainability does not borrow from the future or the collective to pay the present or the few; sustainability nourishes the now while ensuring a tomorrow as vital with possibility and richness as any other moment. We still like that definition and hope that last year’s contributors — from high school students to local businesses and government agencies to nonprofits — helped readers see where your interests and passions can add to the all good work of sustainability that is already underway here in Missoula. (Check out all 51 columns here). To kick off Sustainable Missoula 2019, we are holding that definition of sustainability like an umbrella, and underneath it we have identified simple, concrete and tangible paths our community can — and must — take to achieve a sustainability vision. Our two organizations, together with many of our collaborators, are embracing the 0-50-100 sustainability framework. 0– Zero Waste. Our community sends (almost) nothing to the land fill. We’ve already set the goal of achieving 90 percent waste reduction by 2050 with Zero by Fifty – Missoula’s pathway to Zero Waste. 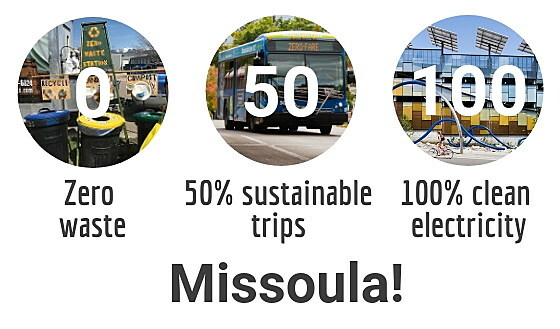 50– 50 percent of Missoula-area trips are made by via sustainable means: walk, bike, bus, scooter, unicycle, skate board, or even simply carpool, and all by 2040! 100– 100 percent clean electricity for Missoula by 2035. How? We take advantage of current tools (think solar), expand options to add more renewable electricity (think policy), and simultaneously shrink the size of the pie by using electricity smarter. These ideas our described in this Clean Electricity Options Report – check it out and help us out! 100 – 100 percent of all Missoulians are engaged in sustainable actions and that the solutions work for all, 100 percent of us! We recognize the social equity component to this, and we know many of the actions needed are easier for some folks to achieve than for others. Because we also know that climate, energy and sustainability goals and actions are only as good as their breadth and inclusivity, part of 0-50-100 is ensuring that we work with the community to ask (and answer) questions like: How can we bring more clean electricity to low-income housing? How can improved energy efficiency efforts target not just homeowners but renters? How do we help so more folks can walk, bike and bus? How can every Missoula area K-12 school participate in Zero Waste programs? How can we better track our progress toward these sustainability goals? 0-50-100 provides residents, businesses and nonprofits with multiple avenues to participate and make a difference. Perhaps first on your list is waste reduction, but once you have that dialed in, why not consider solar panels, or how to use the bus routes and a carpool to reliably get where you need to go? There are many options, and it’s truly through all of us doing what we can and supporting others to do the same that we’ll make the kind of difference that builds the thriving and sustainable future we all deserve. In the year ahead, look for more on 0-50-100 via this weekly column. Once again, articles will be authored by myriad community members, all looking to further engage in the best sustainable opportunities for all. Amy Cilimburg is the executive director of Climate Smart Missoula and Katie Deuel is the executive director of Home ReSource. January 14 – 18: Missoula Downtown Master Plan Public Workshop. Help create the future of downtown Missoula: learn about town planning & community revitalization and provide input for a sustainable downtown. Jan 14 Kickoff: 5-7pm or 7-9pm . Doubletree Hotel. Jan 15-17 Open Design Studio: anytime between 10am – 7pm, Public House. Jan 18 Work In Progress Wrap-up Presentation: 4-6pm, The Wilma. January 15. Support Home ReSource’s Community Sustainability programs. 6-9pm at the Top Hat Learn about the programs, meet the board & staff and hear what’s planned for 2019. 25% of sales will go to support those programs. Jan 15. Public Hearing on proposed amendment to the Missoula County Growth Policy. 7pm in Missoula City Council Chambers. See draft of proposed new land use plan map. View climate and energy events via Climate Smart Missoula’s Calendar.